Alan was soooooooo different from Joe as a baby. He was cuddly, social and just fun. I thought then that most of it was because I was a more relaxed mom and I am sure that was a significant part, but I also believe he was just more typical. He was however a huge baby. He was 10 lb. 7 oz. and 22" long and he was 2 days early! I had four different people (including the nurse at our parenting class) ask me if I was having twins. That was very hard on Mom’s morale! In fairness to the nurse (and the other three peeps) I did gain 49 lbs. that I would claim. I might have gained more but I was terrified to get on the scale at the end. Alan always had a twisted foot. It is even visible in his crib. And when he started to crawl, his foot was always getting in the way. I think the poor guy was just cramped in the womb and his foot grew that way. A little more guilt for mom. Even with his twisted foot, he walked ran at 10 months although his gait is off even today. In many ways Alan was the classic second child (at least in our family). He was resourceful, opinionated, and mischievous. In our 1999 Christmas letter I said "Alan is 15 months old and already has about 20 words so hopefully we won't have any language difficulties this time around." Ha! Mom was so delusional! Of course by the 2000 letter, things were different. Unfortunately, Alan is not talking much and just got tested and approved for First Steps (the program which helped Joe get his speech and language therapy before age 3). Sigh. Here we go again. If there was one lottery in life we would have preferred NOT to win it would be the "All our kids need Special Education for Speech and Language difficulties." And yet when I went looking for pictures for this post I found dozens of pictures of Alan staring intently at other people (usually children) rather than at whoever had the camera. I didn't have that with Joe. I can't imagine I culled them all out so I think Joe just wasn't as interested in other kids as Alan was. The differences as they have grown and developed have been just as noticeable. Of course in the "mom guilt" column I have the extensive language journal I compiled for Joe and with Alan I could only look in the photo album and old Christmas letters and hope I was interpreting things correctly. 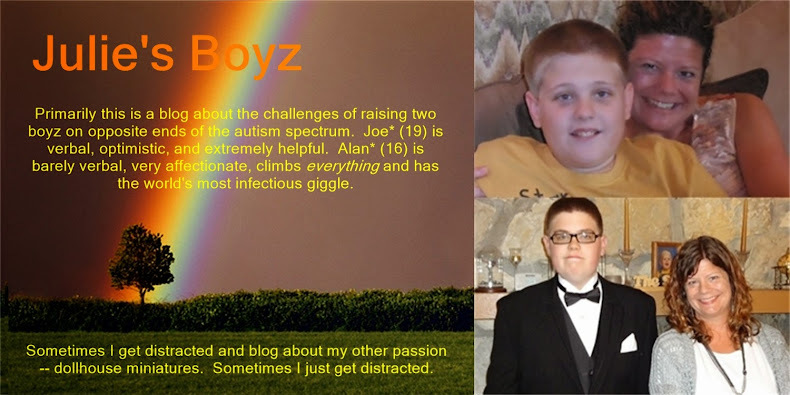 Comparing and contrasting the two … because for two children from the same genetic pool with the same diagnosis, these boyz are as different as night and day! Really great post! Love the pictures, what a cutie pie! Can't wait for the next in the series! Blessings.